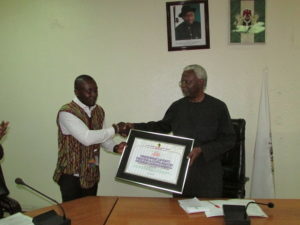 The League of African Development Students (LEADS), the umbrella body for all democratic students unions in Africa, has bestowed the ICPC Chairman with its prestigious merit award of “Africa`s Patriotic Personality” and the Board Members and Staff of the Commission with the Award of “Corporate Mandate Delivery”. The awards were presented by a delegation of LEADS led by Idris Abdulkareem during a recent courtesy call on the Commission`s Chairman and Board members. ICPC Chairman Ekpo Nta commended the union for the honour on behalf of the management and entire staff of the Commission. He pledged to collaborate with the association by providing training through the Commission`s youth capacity-building programme at the Anti-Corruption Academy of Nigeria (ACAN) along with international development partners. While presenting the awards, Abdulkareem said “Mr. Ekpo Nta has alongside his indefatigable team of erudite Board Members and patriotic administrative staff prominently participated in the entrenchment of a robust anti-corruption mandate in accordance with the Act which entails receiving complaints, prohibiting and prescribing punishment according to the law”.